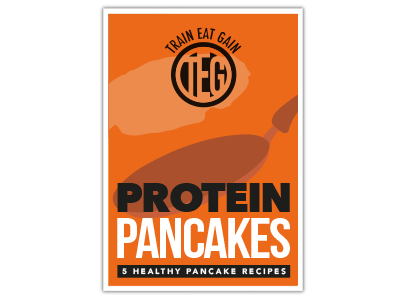 This recipe comes from our Protein Pancakes recipe pack which is free to download! Try it out for yourself and tweet us a picture (@TrainEatGain). This puts a perfect healthy spin on the classic American combo of pancakes, bacon and maple syrup. Of course you can omit the bacon as the pancakes are fantastic with anything but due to their fluffy, crumpet-like texture. They work great with savoury foods like bacon and eggs. The recipe is also gluten free, wheat free, paleo and low carb! We love to see your versions of our recipes – share your photos and opinions of these easy protein pancakes with us via Twitter (@TrainEatGain) and tag Hazel in it too (@TheFoodMedic). Combine the flour, baking powder, and salt in a bowl. Stir in the egg, egg white, almond milk and teaspoon of coconut oil. Stir until thoroughly combined. This may take a few minutes and the mixture will be quite thick. Heat a non-stick pan over medium high heat for a minute or two. Grease it with a good dollop of coconut oil – around 2 teaspoons. Make sure the pan is good and hot before you add the batter – while the pan is heating up place the bacon under the grill or alternatively, cook it in the same pan as the pancakes! Pour your desired amount of batter onto the pan – you should have enough to make 4 medium sized pancakes. Cook until golden on one side, and flip using a large spatula (the pancakes are quite delicate so be careful when flipping). Cook until golden on a low-medium heat. 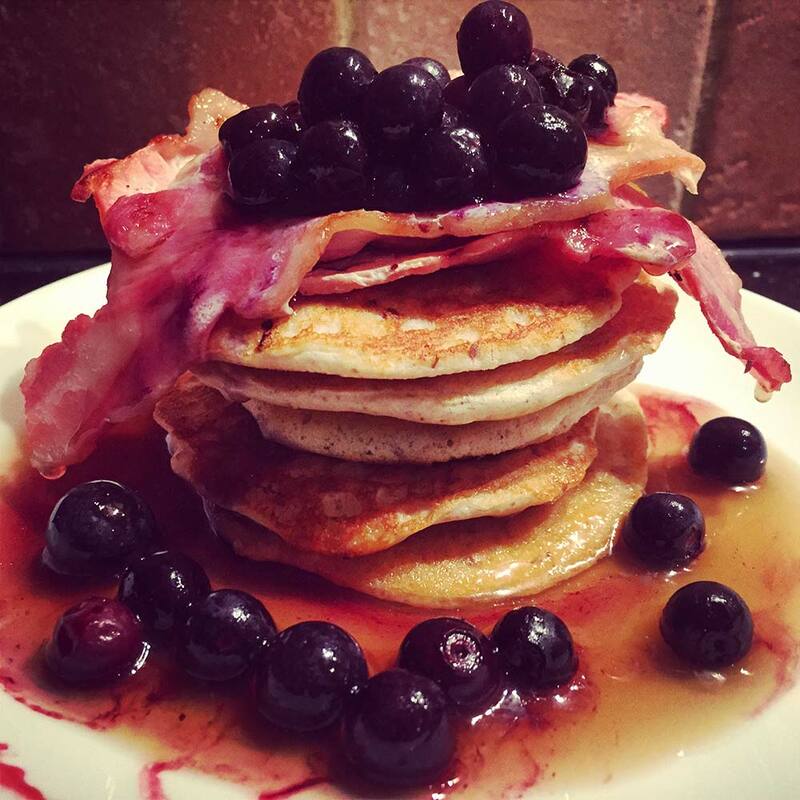 Stack the pancakes onto a plate, place the bacon on top, and drizzle (or smother) syrup on the top – I also like to add a few blueberries to the dish! My name is Hazel Wallace, the founder of The Food Medic. I am currently studying graduate entry Medicine at Cardiff University. The Food Medic arose from my medical background and interest in nutrition and fitness. 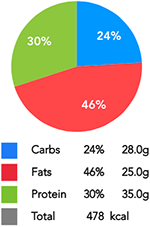 My vision is to show people that eating healthy, or eating ‘clean’, can be enjoyable, uncomplicated and easily incorporated into a busy lifestyle. I want to help banish the myths around healthy eating and ‘diets’, and instead help to promote this way of eating as an everyday, healthy, nourishing way of life. Please check out my website www.thefoodmedic.co.uk for more healthy recipes, nutrition and fitness tips!